Parlor 1 – The Ringmaster's Roost is a lounge offering 20 seats and a full liquor license. The lounge is open four days per week and otherwise open when there are overnight hotel guests on the property. The room is rich in décor and a favorite of patrons. It features many original details such as the china breakfront that now displays the liquor behind the bar, an ornate working fireplace with antique tiles and hand-carved wood mantel that has a built-in brandy warmer. There is also a “Butlers Call Button” located in the center of the floor. Parlor 2 – “The Dining Room” seats 20 and has 12-foot-tall pocket doors that enable it to also be used for small private events. There is a floor-to-ceiling carved mantle that surrounds a working fireplace with antique Lowe tile. A large ornate antique rosewood inlaid table is the dramatic focal point of the room. Parlor 3 – “The Library” seats up to 14 and has lake views. There are custom mahogany built-in book shelves, Persian carpet and a working fireplace. Parlor 4 – “The Game Room” seats 16, has lake views through the beautiful bay window, a working fireplace with antique tile, an exquisite Tiffany-style chandelier and an antique roulette table that has been converted to a dining table. Parlor 5 – “The Music Room” the largest and most dramatic of the parlors seats 24. 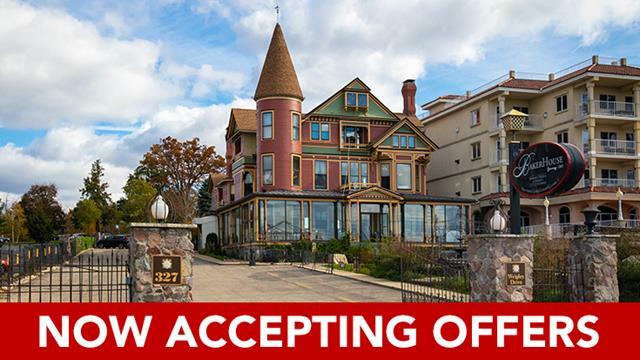 It has four large pocket doors, views of the lake, a turret with dining table, an incredible 14-foot-high, hand-carved mantle withpalladium mirror surrounding a working fireplace with antique Lowe tile. The contiguous Lakefront Garden offers additional fountain-side seating for up to another 90 guests with fully-outfitted patios with gas fireplaces and cocktail cabanas equipped with electric, water and audio cables. The garden is the only location in downtown Lake Geneva able to host lake-view receptions and ceremonies, making the venue truly one-of-a-kind and highly sought after. • Lease Agreement Disclosure. Buyer acknowledges and understands that The Pier has current lease agreements. Buyer acknowledges receipt of current lease agreements and agrees to be bound by same. Upon expiration of current lease agreements Buyer accepts responsibility for eviction, lease or rental negotiation, or other remediation, as Buyer finds necessary in order to clarify legal occupancy status. Buyer agrees to hold Seller, Williams & Williams, and its agents harmless from any and all results therein. Buyer acknowledges receipt of current lease agreements. • Buyer responsible for obtaining any necessary permits or licenses necessary to continue the operation of the business. Seller intends to continue normal operation until day of Closing.